Staying energetic throughout the work day can be a challenge when you’re staring at a computer and at your desk for eight hours. Isadora Baum, author of 5-Minute Energy, shares a few tips on how to stay on your feet and boost your energy with movement! Give yourself a dance break. Pull up a song from your favorite playlist and bust out a few dance moves (in public or private, of course) for 5 minutes. You can repeat this throughout the day when you notice your energy draining—this little bit of movement will be an instant refresher. 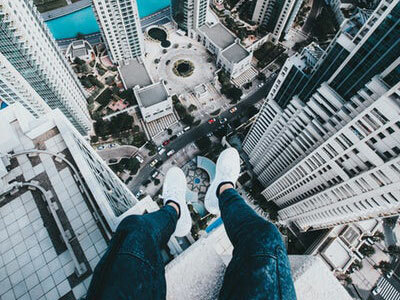 Count your steps. Many apps, watches, and other gadgets can track your total number of steps for the day, so even if you can’t squeeze in a workout, you can still figure out how many steps you walked, how many calories you burned, and what distance you’ve trekked during the day—all of which will add up to provide an adequate workout and supply energy. Set a goal for yourself, and work to get better and better over time. Get up from your chair. Stuck in a sedentary job? At the computer all day? You can still take 5 minutes to stretch those legs, grab a new cup of coffee, take a pee break, or strike up a conversation with a coworker at the opposite end of the hall. Getting even just a little bit of movement in your legs will create a burst of energy that will travel throughout your body. And once you return to your desk, you’ll be way more productive. 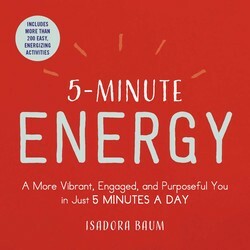 Find out more ways to boost your energy in 5-MINUTE ENERGY by Isadora Baum! Excerpted from 5-Minute Energy by Isadora Baum. Copyright © 2018 by the author. Used by permission of the publisher. All rights reserved.